A Queensland farmer who slipped over on a stray onion at Bunnings has welcomed the hardware giant’s controversial suggestion that the vegetable should be placed beneath the sausage at its charity barbecues. Trevor, whose full name cannot be revealed, signed a non-disclosure agreement with Bunnings after being compensated following a painful accident three years ago. The 65-year-old from the Mary Valley said he entered Gympie Bunnings to buy a whipper snipper and did not notice the caramelised onion on the floor until he fell over backwards. “I walked into the store and it happened so fast, I had leather boots on … I went down on my back,” he said. While the placement of onions on a sausage sizzle has become a talk back topic across the nation, Trevor phoned ABC Sunshine Coast to insist it was no laughing matter. “It is serious stuff, this onion thing,” he said. Trevor said when he returned to a Bunnings store after the incident, he had a panic attack and could not go hardware shopping without “checking the floor for onions”. Under or over the sausage? 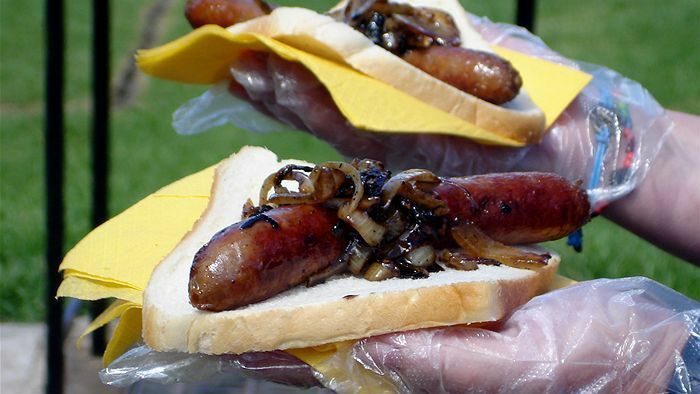 Bunnings’ request to community groups to stop putting onions on top of the sausage at fundraising events at its hardware stores around the country has made national headlines. Chief operating officer Debbie Poole said the recommendation was recently introduced. “Safety is always our number one priority and we recently introduced a suggestion that onion be placed underneath sausages to help prevent the onion from falling out and creating a slip hazard,” she said. “This recommendation is provided to the community groups within their fundraising sausage sizzle welcome pack and is on display within the gazebos when barbeques are underway. Trevor said Bunnings had offered to get him an ambulance after his slip, but he declined thinking he’d “be alright”. The next day he realised how seriously he had been hurt and he worried about an injury to his new hip after having had a hip replacement. “I had to have an MRI scan to ensure my hip wasn’t damaged,” he said. Trevor decided to take the case on himself and pursued Bunnings for the emotional stress the incident caused. “I used to be an amateur boxer and I learnt the punch is not going to kill you; it’s hitting your head on the concrete that is going to,” he said. “When I went down, that is the first thing I thought of — ‘don’t let your head hit the concrete’. “I went to another Bunnings a couple of weeks after and I had a panic attack. While Trevor was originally pushing for Bunnings to stop customers being able to eat the sausages inside the store, he has welcomed the company’s instruction to community groups. So too has Coast Guard Mooloolaba, which relies on sausage sizzles for its fundraising. The group’s Bill Asher said it would make it easier for volunteers. “We thought this was a much better idea [having the sausage on top],” he said. Mr Asher said the Coastguard would sell up to 1,100 sausages on a Saturday morning and nearly half of those between 11:00am and noon. “When you are jostling around the bench and you have got bits of onions falling off and all of a sudden an old granny with the bucket in one hand and the shovel in another slips on onions, it’s not a good look,” Mr Asher said. Mr Asher added that educating the volunteers on the change was not tricky. “It was just a case of a simple edict, onions on first, sausages on second,” he said. But some customers had been harder to convince. “The only query we sometimes get is ‘where are my onions?’ and then we point out they are at the bottom of the sausage, safely tucked away,” Mr Asher said. Celebrity chef Matt Golinski said it did not really matter where the onion was situated in terms of the best eating experience. “I’m a total sucker for the weekend sausage at the hardware shop,” he said. “The fanciest I go is grabbing the American mustard bottle. Even Prime Minister Scott Morrison agreed, taking time out to weigh in after his meeting with Indonesian president Joko Widodo at the ASEAN Summit in Singapore. He said whether the onions were on top or underneath, he would happily partake wherever sausage is. “It is part of our Australian life,” Mr Morrison said. Maurice Blackburn lawyer Jillian Barrett praised Bunnings for the initiative. “Bunnings should be praised in this situation for taking steps, identifying an issue, and taking it up,” Ms Barrett said. She said for a compensation claim to be successful, a customer “would have to prove the business knew about the hazard”. The amount of compensation would differ on each case as it would depend on “the pain and suffering a person goes through, the reimbursement for medical treatment, and loss of wages”. There were guidelines on the amount of compensation that could be given for “pain and suffering”. “In Queensland, the maximum is up to $360,000, depending on the year of the injury, which would be the worst-case scenario,” Ms Barrett said.